I'm happy to host a giveaway today thanks to the folks at CSN Stores who offer great products like kids beds, cookware & home accents. I chose this pretty tote bag from the allmodern.com website. I really love that they offer some great brands like DwellStudio, ferm LIVING & notNeutral. The deal lover in me was pretty impressed with their Modern Deals section as well. I saw some really stylish fitted crib sheets for only $6.25 in that section! 2. I love my followers & feel like they should get an extra shot at this, so....if you are a follower please leave an additional comment saying, "I'm a follower!" or "I follow your most awesome, wonderful blog." Or something like that. Of course if you'd like to become a follower from here on out. Please do so & you can get an extra entry as well. Be sure to leave that extra comment letting me know that you're following me because I'm awesome. Good luck! I will choose one winner on April 7th. i love that bag!! here's hoping it gets to come live with me. I love this tote. Thanks for the giveaway! P.S. I subscribe to your RSS feed and read every post via Google Reader. Doesn't that count as a "follower?" CUUUUTE bag...I would love to win it! i'm a google reader follower! Beautiful bag. Please pick me! I follow your most awesome, wonderful blog! I already am a blog follower. and oh yea, I'm a follower! and i'm a follower, of course. This would be perfect for the summer! I love it. Thanks for the giveaway! The bag lloks cute to carry beach stuff! I just became a follower,but truly have love your site for awhile.Thanks for an awesome giveaway! What a pretty and cheerful design! I love your blog and I love that little bag. So cute! Thanks, Candace! I would love this for the summer! Thank you and LOVE your blog. Great bag! Thanks for the giveaway! Love the bag! Very very cute and springy! What a cool bag. I love the print. Thanks for a chance to win it. I love tote bags and this one is gorgeous! And I'm a longtime follower! This bag is totally cool, and so are you! I also follow (your coolness level being the biggest factor). ooh. and I'm a follower! What a smart looking tote! Beautiful bag. Thanks for the chance to win it! Love your blog! A perfect summer tote. Love it! I Love that bag!! so cute! Hi there! That bag is SUPER cute and I LOVE your blog, I've been following it for a while now. You're very inspirational! fingers crossed that the tote is mine!! I feel like I am at some Chruch service...I DO BELIEVE...I MEAN FOLLOW! Candace is some cool stuff I have followed around since high school! The tote is cute too! I so completely want to carry library books in this thing.. its so yummy! I would love to win the tote! I'm also a follower. I thought I had been forever but I guess I just subscribed before? Anyway, I'm following now. awww what a cute bag! thanks for a chance at this giveaway! Also, I'm a follower! whitney dot archer at gmail dot com. I love the read and white print! It would be a cute bag to carry around. First Off, I would LOVE LOVE LOVE that bag pretty pretty please. Oh, Fancy Bag come live at my house! So pretty. I'd love to win it. I've been a follower for several months. ooooh LOVE this bag! Super cute! Thanks for the chance to win! I've been a follower on bloglines for a while but now..I'm a follower on Google. :-) YAY! Thanks for hosting this giveaway. I would love to win. It's super cute! I am a regular reader of your blog, and I really enjoy your awesome blog. Cute cute bag! Would love to be the lucky winner and give this tote a home! What a cute bag :). BTW, I'm also a follower ;). Lovely bag, count me in! I am a loyal follower of your awesome blog! Me please! Thanks for the giveaway. A lovely, bright bag for spring! Super cute bag. I'd love to have that to take shopping! Great tote! I love the design! thanks for the giveaway, that bag is amazing! You are awesome, I just followed you! LOVE the bag- so cute! love the bag- adorable!! (and on a different note- thank you for sharing some of your more personal posts. with a few of your posts, they are some of the exact things we are going through or just headed into. and its nice to hear from someone (that i think is awesome!!) that they made it through and be reminded that everything works out) thanks!! i am following your spectacular blog! oh my gosh, that bag is adorable!! What a fantastic bag. So bright and cherry for the upcoming Spring and summer seasons. It would be great for me to tote a little knitting project in as well. What a gorgeous print! Thanks for the giveaway! Beautiful! I hope I win. april 7 is my daughter's birthday - hope it brings me luck! you've been on my bloglines - i'm a reader! I love that bag! Allmodern has such great stuff. I like the Dwell Studio kids' line. I love this bag-so bright and pretty for springtime! oooh, I love this bag too. I'm also a follower of your blog via rss feed! I'm addicted to totes and I would LOVE to have this one! I love the design. And of course I'm a follower of your totally awesome blog! Thanks so much again for the chance! So cute! I can always use another bag. You are the bee's knees! I love the bag, I follow you on twitter, and now also on google. This bag is so cute! Thanks for the giveaway. Such a great bag! I love the colors! Love the bag! Great Giveaway! Fab tote! Hope I'm the lucky winner! 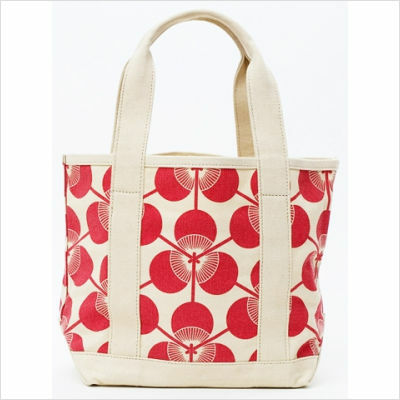 I am really attracted to the red and white pattern of this tote. Love! I'm obsessed with red lately. I'd love to get this to feed my need. I follow your magnificent blog!! Cute tote! Iam always i need of a bag! NEW follower of your awesome blog! what a cute tote! thanks for the chance to win! I am also a follower, and yes, your blog is awesome! What a great tote! I love it! That's such a nice bag. Thank you for creating this giveaway. i follow your awsome blog! this bag is perfect for summer time! What a great beachy tote! I would love to take this tote to the beach! What a great looking bag...I would love to win it! I just became a follower of your posts and am excited to see more of your blog! Why thank you for offering this great tote. what a fun springy tote. love it. i follow you through my reader! What an awesome bag! Wish I could do what you do! That is one adorable bag. this is so cute and spring-like!